The society of Senior Citizens would like to cordially invite you to join their Over The Hill club! The Over The Hill Award Certificate is a hilarious gag gift that will get the entire party laughing. 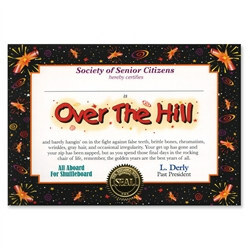 The Over The Hill Award Certificate has a humorous message that is signed by the past president L. Derly and has a golden seal of certification. Check out our variety of other over the hill party decorations that will create a fun memory. Have your tables match your decorations with our large collection of tableware!